Bordering Atorra and the Eastern Empire, the Southern Fiefdoms range from sandy deserts to baked clay to tropical jungles. In Kombara there is a volcanic region around the volcano Komba. In the fiefdoms, one can make easy gold with little more than a strong sword arm. Since no empire or large nation maintains control and polices the land, bandit camps dot the landscape and travel is dangerous. There is always work for bandit hunters and paid caravan escorts. Many small-time lords and warlords employ foreign mercenaries as part of their war-levies and garrisons. The landscape is also dotted with caves, mines, ruins, and other places where treasure hunters can risk life and limb in the hopes of bringing back something of value. Near the border of the Eastern Empire, feudal land fashion is primarily Imperial, though some Atorran influence is still present, as well as pre-imperial human cultural styles. Shari splint armour and heraldic sash; Atorran tunic and belt with imperial obi and sandals; Shar tunic with imperial obi, sandals and trousers; sleeveless imperial robe and obi. The most common style in the Southern Fiefdoms is associated with the Nurian culture. 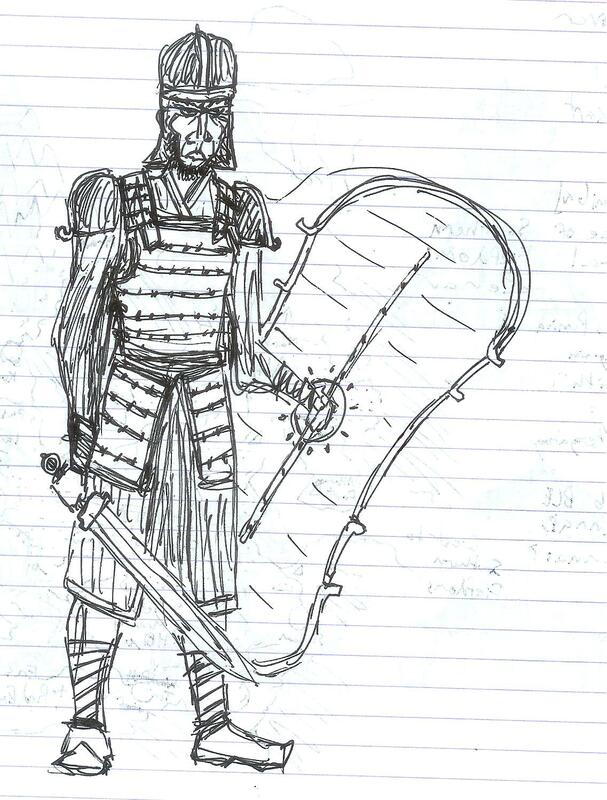 Divergent from early Elven cultures, there are still visible similarities between Nuriani and traditional Mesiani styles, especially in armour and weapons. There are differences, however, which stem from the passage of time and the influence of other cultures. Nurian style is visible throughout practically every eastern continental feudal state, and Nurian peoples and culture are dominant in most of the heartland states where Atorran and Imperial influence is weaker. Nurian architecture is quite similar to that of Mesia as well, but influence from the Shari and the Eastern Empire led to noticeable differences in materials commonly used and construction. Culture and objects consistently reinforce concept of /wholeness from many parts/ … on the flipside, common forms of execution include drawing & quartering, splitting, beheading, and other *divisive* techniques. Nurian religion is based on Mesianic tradition, but in the two gods they emphasize many facets and personalities, practically instilling a polytheistic attitude (compare to Athena Nike vs. Pallas Athena, etc). Nurian art… largely similar to mesian in terms of lots of figures, representational kind of stuff… figures are probably drawn something like classical greek art, with emphasized line sfor muscles, joints, features… animals with exaggerated layers of fur… eventually, concepts like pointillism would be popular. The other common human culture is the Shari. Though they are also related to early elven cultures, they have diverged much more, and have notably more influence from the Eastern Empire.